Coinciding with ICCNC’s Ramadan Open House, the Center will be unveiling its first permanent installation. 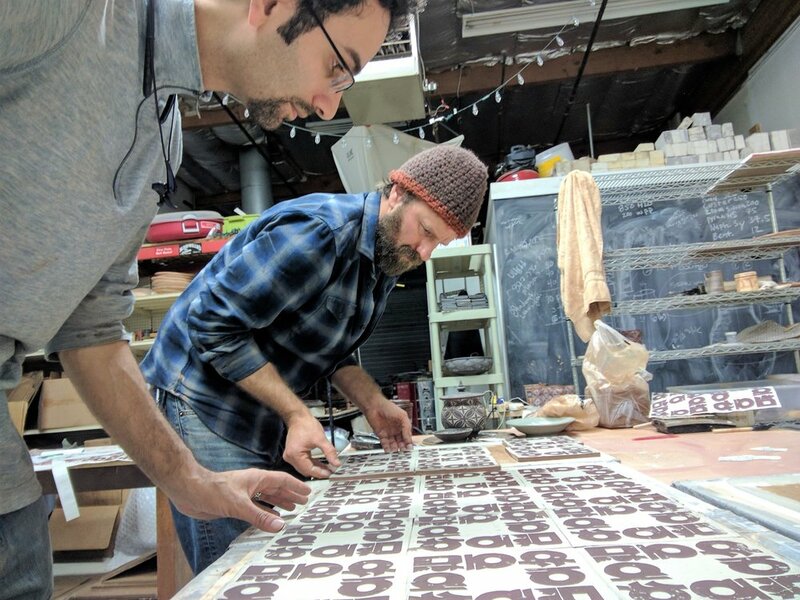 The inaugural Peace Wall is the result of years of collaboration and coordination between two Bay Area artists, calligrapher Arash Shirinbab and ceramicist Forrest Lesch-Middelton. This ceramic mural is the final result of the Creative Work Fund grant that the artists received in partnership with ICCNC. It marks the culmination of careful study and practice of the centuries-old traditions of Islamic calligraphy and ceramics, bringing them into a dialogue, between the lifeworlds of the Islamic Golden Age (8th-14th Century AD) and our present times, and between the value systems that they both inspire. Much like the verses of the Qur’an, ceramic patterns and inscriptions, many of which are traditionally culled from the Qur’an itself, contain meaning that is polyvalent: they may be mystical, poetic, political, amorous, or all the above. So too is signification abundant in the patterns and inscriptions of Shirinbab and Lesch-Middelton’s unique collaboration. Their Peace Wall starts from a familiar place, with the central word Islam, repeated and spliced with the Arabic/Persian inscription, salam/solh (peace), both words sharing the same etymological Arabic root (SA-LI-MA), denoting safety from harm. How could peace, the word emphatically displayed in Kufic style script on the tiling, be something so obvious and appealing to virtually everyone, yet so seemingly elusive and difficult to achieve? Or is it? Often the simplest of principles, of mercy and peace, are occluded by the clouds of politics and the innumerable distractions of modern life. Arash suggests that part of how art can help give way to peaceful action and conduct is through refocusing our attention back to universal principles. These messages go deep beneath the temporal and topical and toward the more universal and eternal values, common to humanity. As is often the case in artistic expression, a message might appear simple, but contain powerful expository prose and dialogical layers. The Syrian war involves many international and regional actors, its fires fed by the confluence of historical, political, and sectarian influences. And though it might appear byzantine in complexity, the pain and suffering of human souls should unite our outrage as a clarion call for peace. The Peace Wall sees two epochs communicating across time and the physical ceramic spaces, making the pleas and wishes of a bygone era contemporaneous with those of today. Nishapur and the Silk Road, the two settings paid homage by Arash and Forrest, historically represent a nexus of intellectual development, culture, art, and the elevated expression of Islamic aesthetics. For Arash, originally from Kerman, Iran, the Bay Area is a contemporary example of the crossroads typifying the progress of these former civilizations. Numerous also are the parallels between the development and progress of Nishapur and Silicon Valley, forever impacting people’s lives. This project is among the many artistic projects and initiatives that ICCNC is supporting through its Art & Culture program and the new IC3 incubator. 'IC3: Incubating Creativity, Community and Civic Engagement' is a pilot program at ICCNC that provides local Muslim-American artists event- and community-building opportunities as they develop new work and build new audiences.